I first heard about Popego when they were a presenter at the TechCrunch 50. Of all the services shown, I found this the most interesting because it appeared to be taking Lifestreaming to a new place. I also found it interesting that they are based out of Argentina, where I lived for a short while as a child. My initial visit a little over a month ago was a bit bumpy but they have since ironed out most issues, increased performance and added new features so it seemed like the right time to re-visit. Yesterday I wrote a guest post on Louis Gray’s blog discussing how Lifestreaming has been a catalyst for what’s coming next on the web. Many Lifestreaming services are doing a good job of importing, displaying and allowing us to interact with the data. But the next step is creating logic and algorithms that do something with the data. The first of these are recommendation engines and that is what Popego, Strands, Twine and several other Semantic Web services are starting to do. At a basic level Popego aims to reduce noise and increase relevance from your social graph firehose. They’ve created a recommendation engine on steroids. They provide a highly customized feed for users created by analyzing Lifestreaming data across several data points and offering manual controls to tweak it. It all begins with the creation of an “interest profile“. First you create an account by adding all of your services. If you have a FriendFeed account this becomes an extremely fast and efficient process. Just provide your account info and they import all supported services automagically. Any additional services can be added manually. Once services are added, content is imported and analyzed to create a global tag cloud generated from the data. 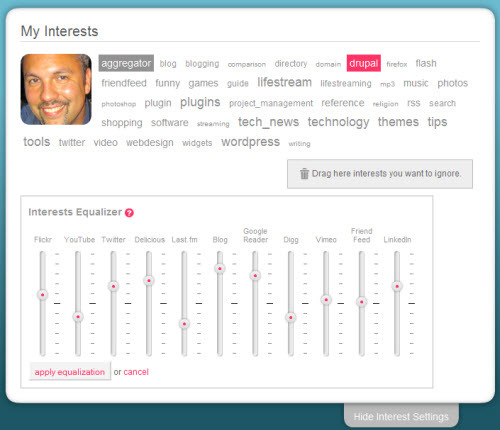 Now that your interest profile has been created, you can spend some time tweaking it. This is done by manually removing any tags that you don’t want and then increasing or decreasing the importance of data based on the service it’s imported from. When you are happy with your settings its time to put it in action and create your “interest feed“. The interest feed is the recommendation engine for all items from other Popego users that match your interest profile. The items that appear in the interest feed include title and link, when it was added, user and service source, associated tags, and % interest match to you. You can also interact with the item by commenting, loving, banning, or hiding. The last 3 provide behavioral actions which the system then learns from for future feeds. You can click on a username to display an overlay widget with a richly detailed profile summary. There are several filters that allow for further tweaking of the feed. You can filter by one or more Video, Picture, Music, Website, Blog, and Microblog content types. You can also choose to either have content delivered based on all users, only your friends, or related which I couldn’t determine its action. Lastly there is an interest match slider which can limit the results to only those that equal its defined relevancy percentage. With regards to friends, I found the functionality a bit misguided and lacking. There currently is no concept of manually adding or following friends on Popego. Your friends are determined by the social graph that was imported from your services. I would like to manually create groups of Popego users and or select them individually as filters. Hopefully they address these issues in the future. The Autoblog provides a public page to share your profile with anyone. Mine is at krynsky.popego.com. This essentially acts as a pseudo Lifestream page. It shows my interests in the form of a tag cloud and displays 10 items which appear to be a subset of data from my services (not in strict reverse chronological order) as if to provide a sampling of my interests. You can use many of the same filters and even page through more of my items. Also one of the cooler things is a list of other Popego users at the bottom of the page displayed with an interest match percentage where you can click on to display their profile widget. Speaking of widgets, the same ones used on the site are portable and can be embedded on any web page. There are 2 flavors. The Picture & Bio widget as well as a facts widget. Below is mine, take a look and click on it to open up my profile. Finally there is a Stats page which provides detailed information about the visitors to your profile page. This includes a tag cloud based on their interests, Avatars with their interest match percentage, and several graphs showing web common web services and interests data. As you can see this is a service that has many areas of exploration and I feel I’ve just scratched the surface. While it doesn’t offer a traditional Lifestreaming experience, It does provide an exciting new way to discover content. One barrier for this type of service to be truly great and meaningful is having a large user base. I would really like to see my interest feed based on scouring a complete dataset of my friends Lifestreams. I hope that many users give this early vision of the next step in Lifestreaming a test drive and fulfill my selfish interests. I checked Popego out as well, and started writing a blog post on it a few weeks ago, but never really got going. It was interesting, but didn't have stickiness as far as I was concerned. How many times have you wished that all your friends from X website were on Y website? – Language filter is coming *very* soon. Hopefully in a few days. – Friending also is coming soon. You'll be able to follow your friends on Popego. – Deeper tag clouds is what we are working very hard now. This is the core of our technology. The biggest challenge on this aspect is scaling this information. – About search, we can (and might) do that, but we aren't right now. Let me know if you want to know anything else about Popego.